The very best gilts shown at the 2019 Oklahoma Youth Expo will be sold Wednesday evening in this year's edition of the Night of Stars Gilt Sale- live from State Fair Park in Barn 8. Bidders will be on hand at the sale- and many more buyers will be joining a live version of the sale online and bidding as well. Blake Kennedy with Kennedy Ventures is responsible for the online production part of the sale- and he is confident that year two of the online part of the sale will be bigger and better than year one, when a limited number actually were sold online. Kennedy talked with Radio Oklahoma Ag Network Farm Director Ron Hays about the 2019 Night of Stars sale- and you can hear their conversation by clicking on the LISTEN BAR below. Pictured here is the action from the 2018 Night of Stars. There will be the sixty top commercial gilts from this past week's 2019 OYE Commercial Gilt Show- and 55 purebred gilts representing the eight breeds that were exhibited at the OYE. The top five gilts in each breed will be sold- plus 15 of the best of the rest of the purebreds have been added to the show order as well. 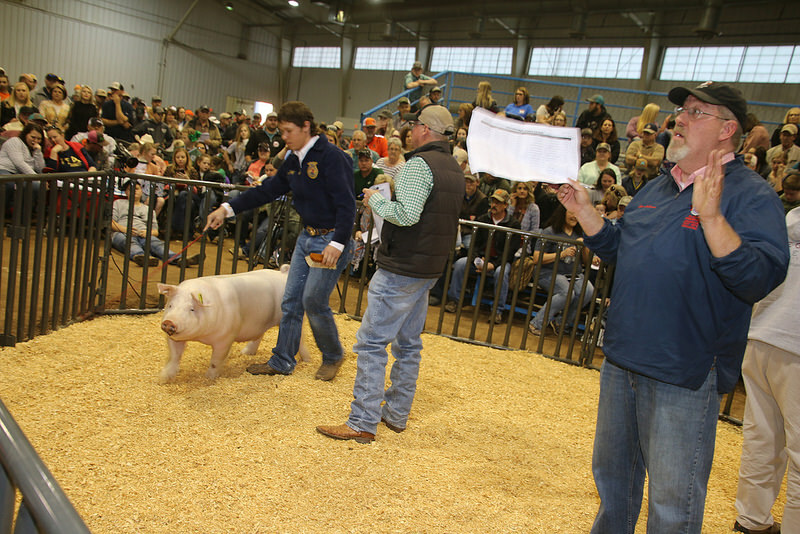 Click or tap here for our earlier story on the Purebred Gilt show at OYE. OYE Executive Director Tyler Norvell told Hays in an earlier interview that the last couple of years- over $400,000 in gross receipts has been generated for the youth showing in the gilt show that qualify for the Night of Stars sale. Kennedy points out that for the young people showing in the gilt show- you don't have to go and buy a high priced weaning weight gilt to make the sale. At least three of the exhibitors who have qualified for the sale birthed their own gilts. That includes the Reserve Supreme Champion Purebred gilt- a Berk owned and raised by Grace Lambert of the Chattnooga FFA. To view the complete list of the Night of Stars list- click or tap here. To learn more about the 2019 sale, click or tap here for info about attending live or registering and bidding online. The Sale is set for Wednesday, March 20 at 6 PM central time.